This is a comfortable three-bedroom home has just been relisted with new renovations and upgrades. 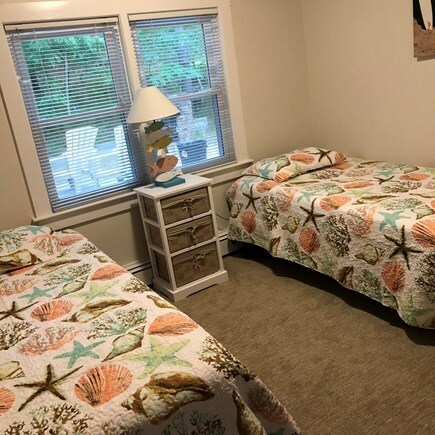 It is located 1/2 mile from LeCount Hollow Beach, which is within the National Seashore, and 2/10 mile from the Cape Cod Bike Trail and a short walk to the White Cedar Swamp Trail. It is just a two minute walk down the road to the PB Boulangerie Bistro , post office, bike rentals, home cooked foods at shop called The Blue Willow, as well as the Beach Comber Store & Seaside Liquors. 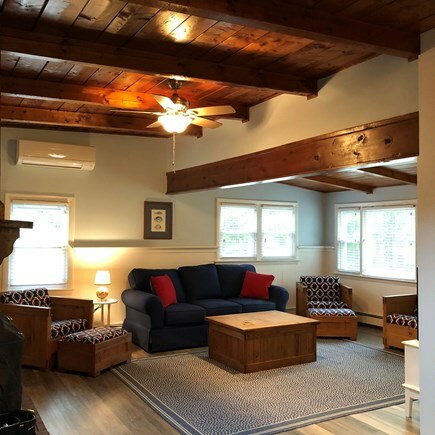 The cottage has a fully-equipped, eat-in kitchen with ample seating for six with a dishwasher, microwave, washer & dryer, and many additional amenities. 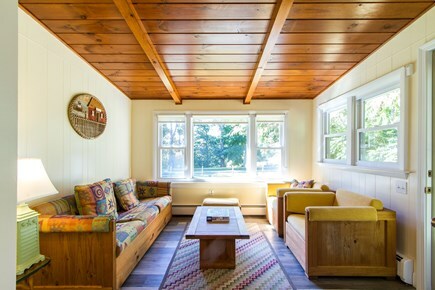 The living room has a fireplace, cable TV, VCR, and comfortable seating.Central A/C. There are three bedrooms and a full bath. 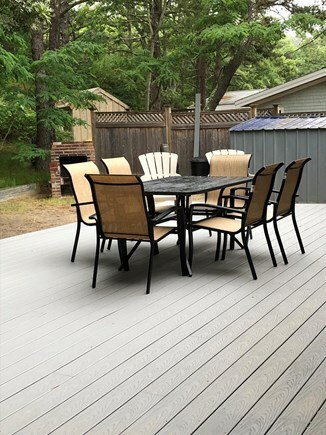 A lovely reading area, large deck with patio furniture, and a built-in charcoal grill. There is also an enclosed outdoor shower. The cottage is fully heated with baseboard hot water/oil heat. WIFI throughout. Additional pricing info: $100 Discount pre week for Multiple Weeks - $150 Cleaning Fee, State and local taxes of 12.45% will apply. 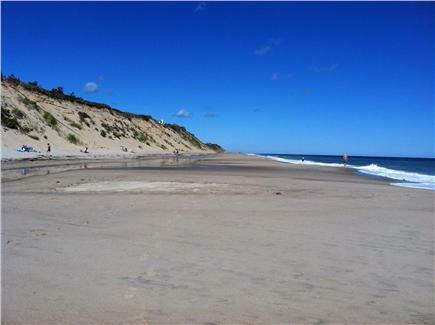 We have stayed on the Cape at least a half-dozen summers, most often in Wellfleet. This was our most enjoyable visit. 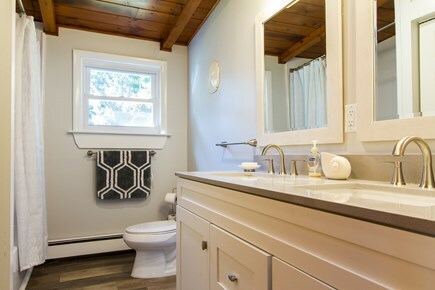 The home was newly renovated, well-appointed, clean and in the most convenient location. The owners were friendly, informative and accommodating. The ability to walk to the beach every morning is quite a benefit. 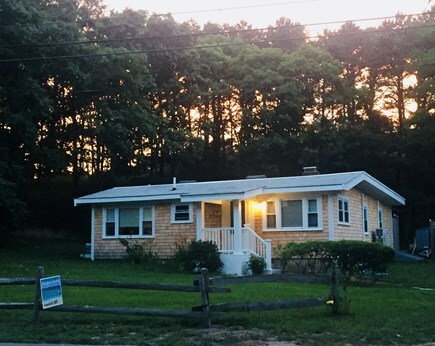 We have been renting on Cape Cod for over 30 years and have been renting the this cottage on LeCount Hollow Road for the last 8 years! We absolutely love it. They are the most hands on, lovely people who are receptive to all suggestions--not that there are very many to make. 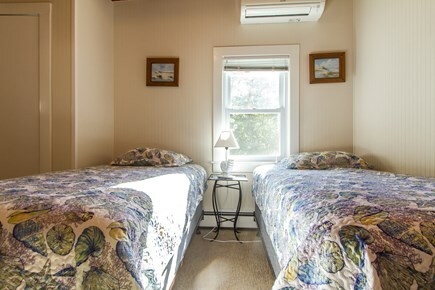 The newly renovated cottage--A/C, new bathroom, new floors, completely repainted, new carpets, etc. is fantastic. 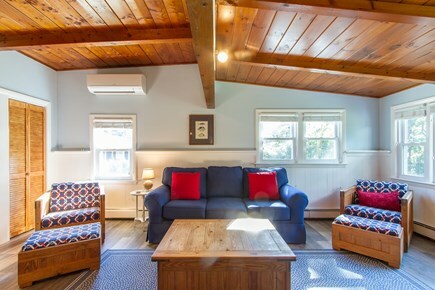 We enjoyed the "old" cottage and the new enhancements make it even more of a home away from home. Super nice cottage; amazing location!! We loved this cottage. It was perfect for our family of 5. We have three kids between the ages of 8 and 4. They were all very comfortable. The area is perfect - close to the beaches and bike trail. Close to town, mini golfing, restaurants, etc. The cottage is very clean and that impressed me. I would recommend staying here. We really enjoyed it and would love to come back again. Note : ALL REVIEWS HAVE BEEN BROUGHT OVER FROM HOMEAWAY AS WE LISTED WITH THEM THE LAST 2 YEARS ! 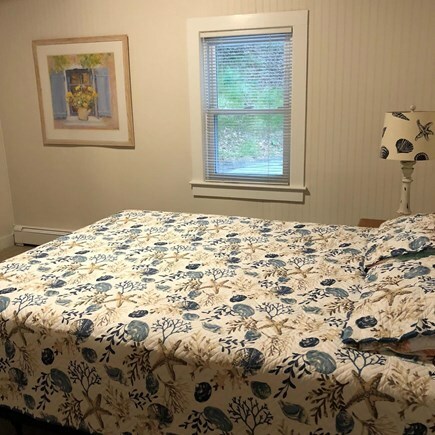 We have been renting at this same location for years and every year we discover new things that we love about Wellfleet and being here. We ventured out a little further on our bikes this year and the convenience to the bike path was awesome! The kids loved walking with us to get our coffee at Blue Willow each morning - then we would hop in the car to the end of the road and see what the beach looked like for the day. We wouldn't stay anywhere else!! We had an amazing week! The cottage was perfect for our family of 5 and had everything we needed. Walk to General Store, 2 minute drive to the beach. Owners were super nice and very accommodating. Comfortable house with all necessities supplied including a shed with boogie boards. 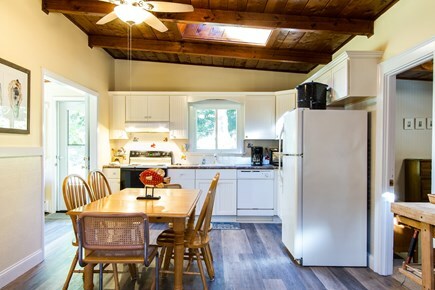 Great newer kitchen with large table and lovely skylights. We loved the outdoor fireplace in the yard. Drinking beer after the beach and toasting marshmallows was fun. Back deck large and outside shower good although both could use some refinishing due to some soggy and splintered wood. Overall fabulous vacation house. Walk to ocean beach is quick! We have owned this property for 30 years and actually purchased it after we got married before our own home . 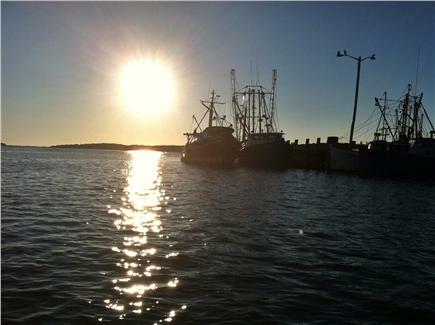 We fell in love with Wellfleet in our college years . 9 Years ago we were fortunate enough to purchase the cottage next door and now are able to spend every weekend there! Location - Location - Location and ALL THE COMFORTS OF HOME ! Wellfleet still retains the look and feel of a classic Cape Cod village, with its quaint town center, whitewashed New England houses, and unspoiled landscape. 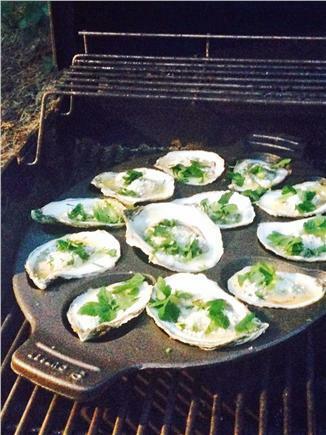 Renowned worldwide for its oysters, Wellfleet also is home to numerous other attractions: galleries showing well-known artists, Zagat-rated restaurants, a professional contemporary theater, a wonderful drive-in that seems a throwback from days gone by. And a dynamic community that makes Wellfleet a thriving place to visit . 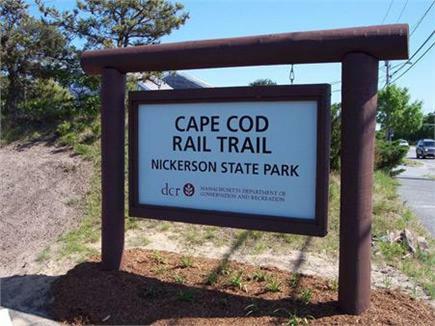 It is also home to the Cape Cod National Seashore, a Massachusetts Audubon Wildlife Sanctuary, and other protected land, maintaining a pristine natural environment full of beautiful marshes, pitch pines, scrub oak and bayberry interplaying with coastal dunes and seashore.